The news spread like wildfire along the southern slope of Mt. Tsukuba. 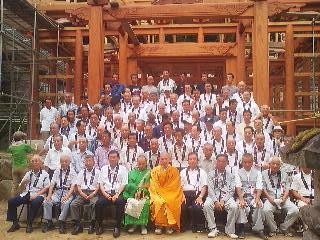 On December 8th 2009, the Main Hall of one of the area`s most important Buddhist temples had burned down to the ground. Why do I say important? Well first, it is quite old. Though the wooden building which was lost was consecrated in 1790 and was a mere 200 years of age, the temple itself was actually established along the old pilgrims road to Mt. Tsukuba way back in 1323 by the priest Jokai (上海上人). It was long closely associated with the Oda Family, who ruled for hundreds of years from nearby Oda Castle (of which now hardly a trace remains). In the surrounding area there were about 500 branch temples affiliated to Fumon Ji, which explains the fact fact that so many of Tsukuba`s Buddhist Temples belong to the Buzan Ha Branch of Shingon Buddhism ( the same branch and sect as Fumon Ji). And third, the main reason for the great consternation raised by the fire, is the fact that Fumon has more than 500 DANKA families, dues-paying members who have their family graves or funerary tablets on the temple grounds. The burning of the main hall meant that memorial services could not be held in the place they had been for more than 200 years. It also meant that the DANKA would be asked for donations to pay for the unbelievably expensive undertaking of building a traditional Buddhist hall. Because of the great cost involved everyone understood that it would take years to raise the money and for the project to get underway. Even without its rustic old main hall, Fumon-Ji still had plenty of visitors, especially hikers or cyclists who took the old Tsukuba Road (つくば道) which takes you from the main commercial street in the town of Hojo up to the Mt. Tsukuba Shrine (a two-hour walk). Anyone who stopped by could enjoy it`s old gates and an abundance of sacred stones and monuments** strewn across the extensive grounds (especially rare is a nine tired-stone tower from the Muromachi Period). The views from it hilltop cemetery can also be spectacular (though there is an eerie spot way back in the woods where one of the temples priests became a SOKUSHIN BUTSU (即身仏)- meaning he meditated without food or drink until death A large stone Jizo statue marks the spot). If you were lucky, and the priests wife was in, you would surely receive a hot or cold drink (depending on the season) and perhaps some snacks, as well. The Shana`s. the family who has lived at the temple for centuries and served as its priests, are so hospitable that even when I brought about large groups of people (sometimes busloads of them! ), refreshments were provided for everyone- on the house! Then one day last week, I got a message from the priest`s wife, Hiromi-San. The Jotoshiki for the new main hall would be held on August 11th. I realized right way that this was something I would not want to miss! What is a Joto Shiki (pronounced JOH TOH SHIKI)? 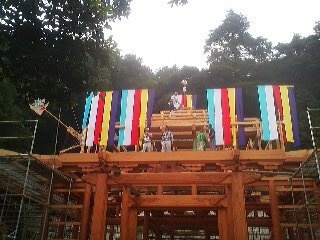 For more than a thousand years the Japanese have held a series of ceremonies for various stages of construction projects. When these first came to be performed in the 7th century, they were held exclusively for the construction of temples,shrines and the buildings belonging to the elite. 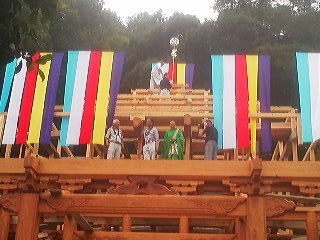 The first in the JICHINSAI (地鎮祭)- the Ground Pacification Ceremony, which is extremely common today for construction of any sort. This is a ceremony which is held before construction work begins and is meant to ask the spirits of that particular piece of ground permission to build there, and to rid the spot of any impurities. It is also a prayer for the safety of the construction workers- who might not do the work unless such a ceremony is held ! The second ceremony still commonly performed today (though much less frequently than the JICHIN SAI) is the Joto Shiki (also called the Mune Age Shiki-　棟上げ式 – or TATEMAE SHIKI ). 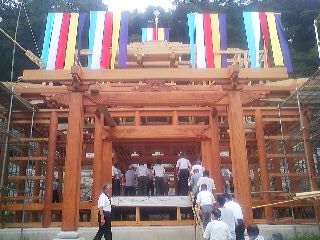 This ceremony is held when the skeletal structure of the building has been completed. 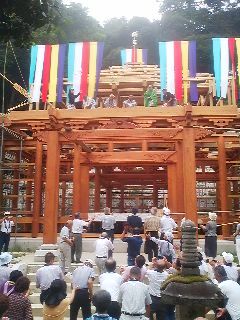 This is a much more festive occassion than the Ground Pacification Ceremony and it often involves tossing rice cakes, snacks, and even money, from on top of the framework down to the crowd gathered below. Such events are especially popular in the countryside- especially in Tsukuba`s old neighborhoods. 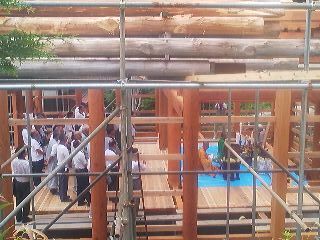 The Joto Shiki also involves praying for the safety of construction workers and for the future residents and users of the building under construction. 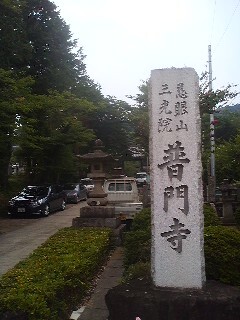 There is also a ritual hammering on the MUNAGI (棟木)- the buidings central pillar. 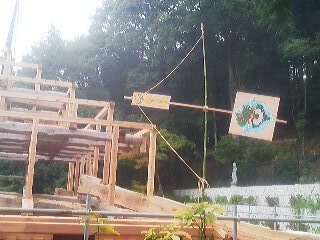 These construction related rituals have their roots in ancient Chinese Geomancy and Yin-Yang Theory and were influenced by both Japanese Buddhism and native Shinto beliefs and aesthetics. 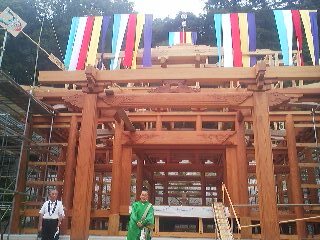 After the Meiji Restoration of 1868, however, and the forced separation of Shinto and Buddhism ( previously there had been no clear separation) on most occassions these construction related rituals have been held in the Shinto style and officiated over by Shinto priests. Fumon-Ji, however, as a Buddhist temple, would naturally be holding a Buddhist style ceremony- and that ( I thought) would be something interesting to see. August 11th was hot and humid- in fact the conditions were not unlike those of the Amazon jungle. 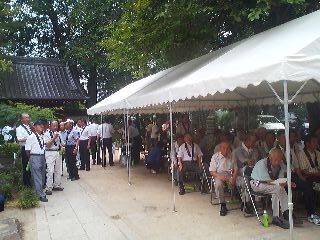 When I arrived at the small road that leads to Fumon-Ji I found it lined with cars (and many of the little trucks used by local farmers) and dozens of elderly males joining me in the walk towards the temple. These men all had purple sashes around their necks indicating that they were DANKA. When we passed through, the KURO-MON and AKA-MON gates, some of the oldest structures in Tsukuba. We all gasped with surprise- as we saw before us the surprisingly large framework for the new structure- all bedecked with colorful Buddhist banners and other special amulets. In the inner court-yard some tents had been set up to provide shelter from the elements and there were of course refreshments- served by the ever cheerful Hiromi-San and her daughter-in-law. It was so humid, though, that everyone present was soaked through with sweat and the chirping of the cicadas so loud that we could hardly hear ourselves think. At about 3 PM, the priest greeted us, and metioned how the last Joto Shiki had been held at Fumon Ji more than two hundred years ago and looking at the impressive wooden posts and beams (oaks, pine, and cedar) he expressed the hope (and belief) that the soon to be completed structure would servre the DANKA for another 500 years. Then it was picture taking time. After that the DANKA walked up a plank into the heart of the structural framework where an altar had been set up. The Priest`s son, Yusei- also a priest, sat in front of this altar, heavy laden with fruits and other offerings and let out an unearthly song- an ancient chant brough over to Japan in the 9th century by the priest Kukai. who learned it from a priest he had encountered in the ancient Chinese capital of Chang An, who had himeself been the disciple of a monk who had come from India. After this singing had ended. Father and son began chanting one of the most important sutras of Japanese Buddhism- the HANNYA SHINGYO. Some of the people around me, knowing this sutra by heart, were chanting quietly along. 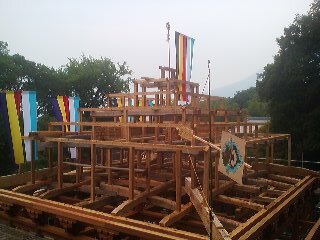 After this was finished (all together in about 15 minutes), the DANKA piled out of the framework and the construction crew (and priests) climbed up to the rafters. There they ritually pounded the main post before tossing rice cakes into the crowd. Since these are hard and heavy, this shower of MOCHI can be a bit dangerous and while I was trying to take some pics I got socked on my noggin!….. Ouch! Why is MOCHI tossed at Joto Shiki? Well for one reason, they are a sign of celebration, and shared with guests, they represent an auspicious occassion. Some also say that throwing MOCHI is a way of cleansing the area of bad luck. Another theory that I have heard is that they represent the falling leaves of trees- the tre out of which the structure is made. Trying to catch or gather up treats showered upon you from up on high can be quiet fun ( if you dont get beaned)- and everyone left the ceremony with their stash of MOCHI and a big smile. It will probably take a few more months to complete the construction, but when it is all done- I will post some pics of the new Main Hall. * Though various books on local history give this huge figure for the stipend given this temple, Priest Shana told me that this amount is an exaggeration, and was a set expression WORTH TEN THOUSAND KOKU which meant that everyone passingthe temple, including high ranking samurai and government officials had to dismount when passing by its gate. ** Before the second gate tothe temple is a monument attestint to the fact that members of the Tengu To (天狗党) Party, a group a anti-foreign-pro imperial fanatics from Mito who holed up at Fumon-Ji in 1864 before being captured or killed. 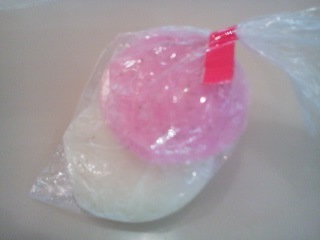 The mochi rice cakes that got me on the head!- interestingly they are in the Shinto colors- red and white! Many thanks for another wonderful article, Avi. Speaking of the old Tsukuba Road (つくば道)from the main commercial street of Hojo up to the Mt. 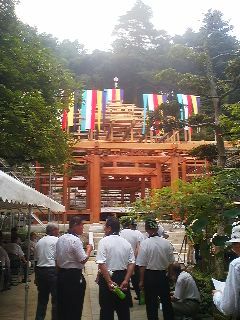 Tsukuba Shrine, would it be possible to do an article about walking that route sometime, describing the various places along the way? I’d also be interested in knowing which parts are accessible by car. The reason for this is that my former Japanese teacher in Tokyo has expressed interest in checking out the old Tsukuba Road, but she’s 86 now and would find it hard to walk for two hours. Alternatively, if you could give me an idea of where I could get this info., I’d be very grateful. Hello Bob ! Thanks for reading Tsukublog and especially for sending in your comments! The southern approach to the Mt Tsukuba Shrine- the Tsukuba Road- beginning in Hojo, is a pleasant walk- if you are an avid walker! Of course, since there are so MANY things of interest along the southern slope of the mountain and in the towns of Hojo and Kangori, a car would make it possible to see more. I will write an article tonight about walking the Tsukuba Michi- as I have done it it many times(I used to live in Hojo!). If you DO go with your older teacher I would recommend waiting for the more comfortable autumn weather. Every season, though has its special characteristics. Unfortunately the walk this time of year means punishing heat and humidity. I will start writing now- so have a look tomorrow. Many thanks, Avi.I’m looking forward to reading your article. Will also check out the info. at the Old City Office in Hojo when I get a chance.